One thing that any visitor to Crete will notice is the sheer friendliness of it's people. Admittedly some of the waiters tourists will encounter in the area of Chania harbour can be a bit over-zealous, you might say even a bit intimidating sometimes in their attempts to get you to eat in their taverna and not a competitors. 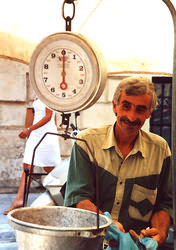 But the normal, healthy average everyday Cretan out and about will almost always respond helpfully and more often than not with a smile if you approach them about almost anything. But please, don't be an old - English Colonel Blimp!! I once heard a fully adult male tourist (obviously desperate) ask a young female shop assistant in the most emphasized desperately slow English I have ever heard if she could tell him "WHERE - IS -THE - NE-AR-EST - TOI-L-ET?" She replied in fluent English that it was directly opposite, had a figure of a man on it and was labeled "Toilet" in English!! He said, dashing off "THANK - YOU". Speak slowly and loudly - archaic advice to Brits abroad. Can you imagine a Greek asking the same question in the UK, speaking Greek slowly and loudly?!! Here, even where there is a language problem someone will invariably help and showing a little interest in others can take you a long way on Crete. Getting out and about here we meet many people, not always Cretan, not always even Greek, but many who help make this part of the island what it is, an outstandingly enjoyable experience. On this page I am hoping that you will find some of the people we meet as interesting and enjoyable as we do. 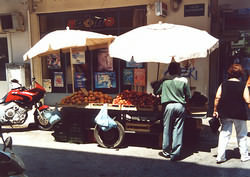 Across the road from the front entrance to Chania Central Market stands the National Bank of Greece. Passing the bank on your left, the first street on your right, almost opposite the side entrance to the bank is Odos Boloydakidon (Othos Volouthakithon). 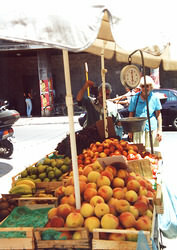 Here, almost every weekday for the last twenty years or so, Vasilis Malekakis has sold the fresh-fruit of the season to all comers. With it's twin brolleys protecting mounds of fruit, and of course the smiling Vasilis, Vasilis pitch is easily recognizable. It is quite difficult to get him to stay still long enough to get a good picture.... If you pass regularly you will notice that the contents of his stall change dramatically from apples and pears; to peaches and nectarines; strawberries; cherries and even Cretan bananas, according to the harvest in season. Born in 1946 Vasilis tells us, between weighing out the fruit for customers and expertly avoiding the closely passing cars at the end of this one way street as he maneuvers around the stall, that he doesn't mind photographers. It seems that he something of a tourist attraction, and being photographed an occupational hazard. But don't let that be the only reason to pay him a visit - his fruit is superb. Supporting this local tradition isn't even a matter of "stop me and buy one" - his mobile stall remains on the same spot, all you have to do is buy some! Vasili's stall is en-route to the municipal gardens. On the corner of Odos Boloydakidon and Odos Tzanakakis. If you change your holiday cash at the National Bank leave by the side door - his stall is directly across the road.